The summer season has finally arrived and you’re likely looking for deliciously healthy fruits to enjoy in smoothies, juices or on their own. But with the large variety of fruits in season, how do you know which ones to choose from? Let us introduce you to the stone fruit—this type of fruit is soft and fleshy on the outside and contains a hard ‘stone-like’ seed on the inside. Generally, these fruits are in season during the warmer months and can’t grow as the temperatures drop. So if you want to take advantage of stone fruits, it’s best you enjoy them in the summer. 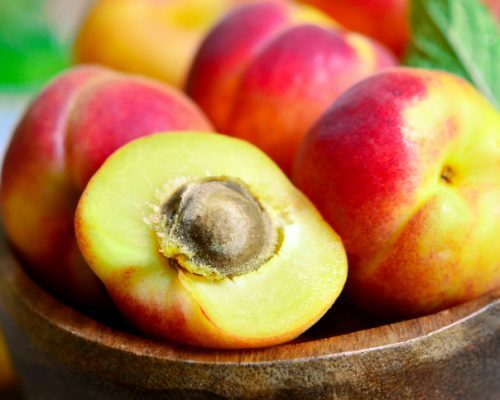 This season, enjoy delicious stone fruits like peaches, nectarines, plums, apricots and cherries! Stone fruits, in particular peaches, apricots and nectarines, are high in vitamins A and C, fiber and potassium. A medium apricot, for example, contains approximately 3.5 mg of vitamin C and 674 IU (international units) of vitamin A. So you can get the recommended daily amount of vitamin A, and about 20% of your vitamin C needs with four to five apricots. Peaches: Peaches, and other stone fruits, are high in potassium which is essential for muscle function. Two small peaches exceed the amount of potassium offered by one banana. Peaches also work to make the skin healthier and offer vision-supporting nutrients. Apricots: Apricots support healthy heart and eye function. Their fiber content will help keep you regular and can aid in managing healthy cholesterol. Eaten prior to a meal, apricots can aid in digestion. Plums: Plums contain antioxidants which can fight off free radical damage, protect the skin and promote good health. Plums are rich in potassium and fiber, which is beneficial for muscle function, regularity and keeping cholesterol down. Cherries: Like other stone fruits, cherries contain antioxidants as well as fiber and potassium. A recent study published in the journal Nutrition suggests that the antioxidants found in cherries can help improve circulation. Their nutrients can help manage overall good health. Consuming cherry juice, in particular, has been shown to help fight inflammation and treat muscle pain. Stone fruits are a great part of a healthy diet. From promoting healthy skin, vision, and muscle function as well as building bone strength—stone fruits should be included as part of your diet this summer. You can enjoy stone fruits on their own or in combination with other ingredients. Take a look at our recommended stone fruit recipes, which are sure to be a hit during summertime gatherings. Looking for a delicious and nutritious way to enjoy stone fruit? Look no further than these summertime desserts. Peaches are used for this refreshing parfait—and it shouldn’t put a dent in your diet. You don’t need to use the oven to create a perfect protein-packed dessert. Try grilling the peaches to bring out their sweetness. Pair with Greek yogurt and you’ve got a quick (and delicious) dessert that is perfect for the summer season. Just make sure to use Greek yogurt—it has almost double the protein of its thin, American counterparts. Place the peaches, flesh-side down, on the low-heat portion of a grill. Alternatively, place them flesh-side up underneath a broiler. Cook for three to five minutes, or until browned and juicy. Remove from the heat and slice. Place 1/2 cup of the yogurt into a bowl and top with half of the peaches, 1 tablespoon agave and 1/2 tablespoon of the walnuts. Repeat with the remaining ingredients. Preheat your oven to 400 degrees. Place a little butter in a shallow baking dish and melt while oven is preheating. Remove your baking dish from the oven and add equal parts honey and orange juice to the pan and stir to combine. Place the halved and pitted plums, cut-side down, in the dish. Bake about half an hour, turning once in the last 10 minutes to spoon juices over the fruit. Serve warm with yogurt, ice cream or on their own. Enjoy! Healthy eating doesn’t have to be hard. If you enjoy fruits while they are in season, you can fully reap the freshness and all of their natural antioxidants. Stone fruits are a great addition to your summertime diet. But before you know it, summer will soon be over—so get to them while you still can!